The new head of the United Nations health agency took office Monday with a pledge to boost the fight against AIDS and other global killers. World Health Organization director-general Dr. Jong-wook Lee also said he wanted to improve international monitoring to help tackle outbreaks of diseases like SARS. Lee, a South Korean tuberculosis expert who previously ran WHO's Stop TB program, was elected in January by the executive committee of the 192-nation agency. He replaced Gro Harlem Brundtland, a former Norwegian prime minister, who announced last year that she did not want a second five-year mandate. Brundtland, 60, stepped down after successfully transforming WHO from a disillusioned and badly managed organization to a high profile agency that has put health firmly on the global political agenda. Ahead of a formal inauguration ceremony Monday, around 200 WHO employees lined a marble hallway at the organization's Geneva headquarters to applaud Brundtland and Lee as the new director-general walked with his predecessor to her waiting chauffeur-driven limousine. "See you in Nice," a grinning Brundtland called out to close associates as she sped away from the building with her husband, Arne Olaf Brundtland. The couple own a villa near the chic French coastal resort. 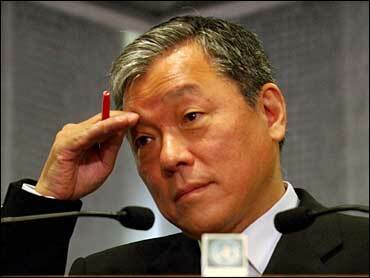 Lee, 58, has spent 19 years at WHO and is the first South Korean to head a U.N. agency. He has won praise for his low-key but efficient management style as head of the agency's tuberculosis program. Speaking to about 500 WHO staff who attended his inauguration, Lee said his mandate would be defined by the fight against HIV/AIDS — particularly in the hardest-hit poor countries. Of the 42 million people worldwide infected with HIV — the virus that causes AIDS — 29 million live in sub-Saharan Africa. AIDS has already killed more than 17 million in the region. "Today, as the HIV/AIDS pandemic enters its third decade, fresh political will and new technologies have created an opportunity to turn the tide of this global killer," Lee said. "The international community must act now. "Our work together in the coming years will be guided by three principles: We must do the right things. We must do them in the right places. And we must do them right away." Lee said he had created a new AIDS, malaria and tuberculosis "leadership team" to boost WHO's role in the battle against the three diseases, which often strike together. The WHO unit will be led by Dr. Jack Chow, who currently is the special AIDS representative for U.S. Secretary of State Colin Powell. Lee said the team will study ways to achieve the goals set in the WHO's "Three by Five" program, which aims by 2005 to provide three million people in developing countries with antiretroviral AIDS drugs. It will also monitor drug resistance, which is causing growing concern worldwide. Resistance is mainly caused by patients not taking medicines on schedule, allowing mutant viruses to evolve. Lee said he also wanted to reinforce WHO's Global Outbreak and Alert Response Network — the system operated by WHO that identifies contagious diseases like SARS and Ebola and passes on advice to governments on how they should be controlled. Although WHO won widespread praise for its handling of the SARS crisis and for helping to confine it largely to Asia through rapid travel warnings, shortcomings in the system have been identified — especially at local and national level. Lee said the agency would spend less of its US$ 1 billion annual budget in Geneva and more in affected countries in an effort to improve monitoring. The new director-general also announced plans for a training program for young medical professionals from poor countries, saying it would help hard-hit nations better tackle a range of diseases. The two-year program will enable individuals to work and study at WHO headquarters and the organization's field offices, to create "the next generation of international health leaders," Lee added.